‘Esports For Everyone‘ is a convention for the esports fanatic. Lovely Professional University in Phagwara, Punjab is home to this convention and wants to take professional gaming in India to the next stage. 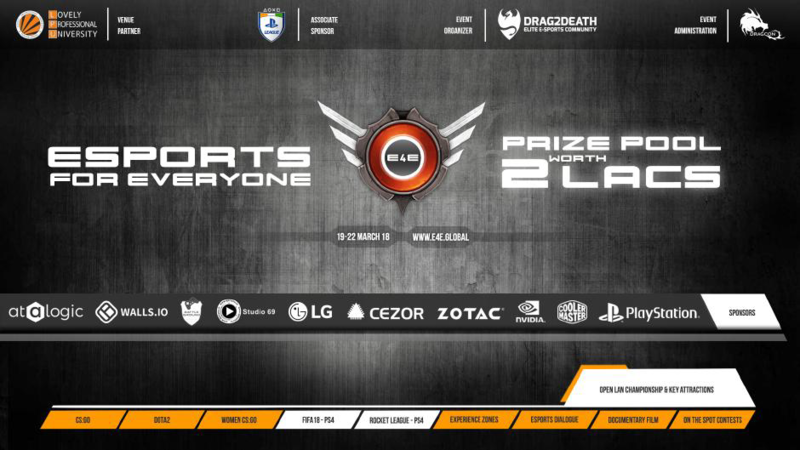 This event is hosted by Drag2Death; a gaming initiative revolving around the growth of the esports community in India. They have been involved in hosting various esports events across the country. Initiated by ATALOGIC in 2015, the idea of the convention is to bring in newer teams to the table and turn them into professionals with many competitions at different regional levels. The university aims to make India the next powerhouse of esports; with the support of Dragcon, a college student welfare division, to help spread the word on the rise of esports and to show it off on a bigger stage than we normally see. The banner for the upcoming tournament, Esports For Everyone. Professional gamers will take the most out of this event, but the spotlight here is that esports is growing in India and it will be huge before we know it. I would like to think that it already is and will only go uphill from here. Spotlight on invitation to 32 teams for CS:GO and in addition to that, 16 more women teams. 32 DOTA 2 teams. 128 and 64 players respectively for FIFA 18 and Rocket League on the PS4. Shows a really good number of attendees already. Hopefully, it takes the Indian esports scene to places. Don’t forget to check out all the experience zones at the event. They’ll be giving away a lot of goodies and gadgets and be throwing contests all over the place! 4 days of endless fanboyism! The E4E convention begins from 19th of March and will conclude on 22nd. Monday to Thursday. If you guys are going to be there, let us know!